Golf accessories make the sport fun and convenient. Some accessories enhance the experience, and others are necessary. It’s a complex game. The gear needed is no different. You do not overlook details when playing. The same goes for your equipment. Be sure you have what you want. More importantly, make sure you have what you need. Watersavers Turf can help. In addition to high-quality golf turf, Watersavers also has golfing accessories. Like our turf, our golf accessories are of the best quality. The staff at Watersavers ensures it. You will thank us later! Let us start with the obvious. It’s not a golf accessory, but you need it if you want to play the game–grass. 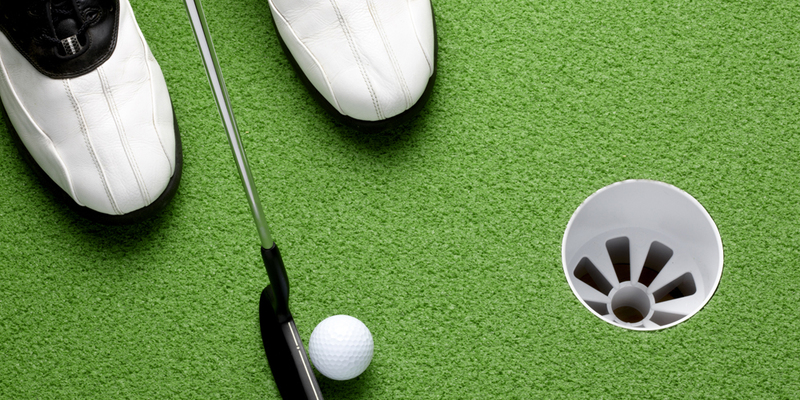 Ideally, golfers practice their swing on a putting green. However, putting turf is better. Unlike grass, putting turf allows for different ball speed and increased skill level. Golf turf is a safe and eco-friendly alternative to living grass. It is safe for pets and safe for kids. An artificial putting green looks great and requires little maintenance. Less to worry means more time to focus on your game. Whether you are considering a change for your home, work, or club, Watersavers has plenty of choices. We have affordable rates, many style options, and friendly service. From the green to accessories, check out Watersavers Turf today for all your golf turf needs. Practice makes perfect, right? Who has the time to practice every day? At Watersavers, you can purchase professional grade golf turf and make an indoor putting mat. This allows you to practice at home or at the office. On your lunch break you can improve your swing, stoke, or style. At home, practice during the commercials of your favorite T.V. show. Regardless of where or when you choose to practice, convenience is necessary. Regular practice is essential for improvement. Putting mats help alleviate the hassle of going to a course or driving range. You can avoid the crowds and fees and improve your stroke at your own pace. Your stroke will surely get better if you commit to regular practice. Why not make practicing convenient for yourself? You deserve it. Dreaming of a pro-setup in your backyard? Want to impress your friends? Look like the pros. Get accessories that make a difference. Watersavers can help you obtain your dream pro-setup. We offer golf flags and golf flagpoles. Flagpoles help mark holes on a putting green. Markers give you the best visibility. Never guess the distance or second-guess your vision again. Mark your target and swing away. We carry a variety of colors. We also have some customizable features. If you are looking to get serious with your game, or maybe just a little more fashionable, Watersavers has what you need. Our accessories and the right surface could turn you into the next big thing! Looking for pro-grade golf cups? We have those too.Compatible with our golf flagpoles, Watersavers has all the right accessories. Golf cups give your green a professional feel, forcing you to do your best. Nothing is more satisfying then hearing that ball hit the bottom of the cup. Watersavers can help you achieve this satisfaction. The best motivation is feeling like a pro. These top-of-the-line products can give you that feeling. If you are playing an eighteen-hole game or just practicing, you should do it like a pro. Watersavers Turf has the accessories to turn your green into a pro-game experience. Install a putting green, or just purchase a mat. Professional grade surfaces and accessories will likely increase your skill level. It will also give your home, office, or backyard a stylish boost of color. Watersavers Turf can help you choose the right golf products. Imagine practicing without leaving your house. Enjoy practice when and where you want. You could perfect your skills or just have fun with friends or colleagues. You can improve your weaknesses or analyze mistakes. Your options are endless. With the right recommendations from our expert staff, your dream putting green is within reach with Watersavers Turf. Give us a call at 844-974-8873, or chat with us online for more information.